Be ready for kickstarter and please spread the word about upcoming 1st Wonder! Click READ MORE to check out a new concept art! MDK2 HD is now available through Steam! MDK2 HD was officially released yesterday to the Steam service! Now you can choose through which platform you prefer to play - Steam or Beamdog. You can buy MDK2 HD through Steam for $14.99. The current cost of MDK2 HD through Beamdog is $7.50! MDK 2 HD is coming to Steam! Hello to all faithful MDK fans. MDK 2 HD release to the Steam service. Everyone thought that HD version will be available exclusively through Beamdog platform. We've decided to ask Trent Oster (founder of Beamdog and Overhaul games), what has changed in this case. "After a great deal of fan requests, we jointly decided to end the MDK2 HD exclusivity on Beamdog to bring the game to the Steam service." MDK 2 HD is coming to Steam on July 30th, 2012! We've also noticed that many fans of MDK 2 still demands its release on Wii in Europe. Unfortunately, we don't have good news for Wii players. "Sadly, we have no plans for an MDK2 Wii European release. Interplay may choose to undertake it, but we currently have no plans in this area." 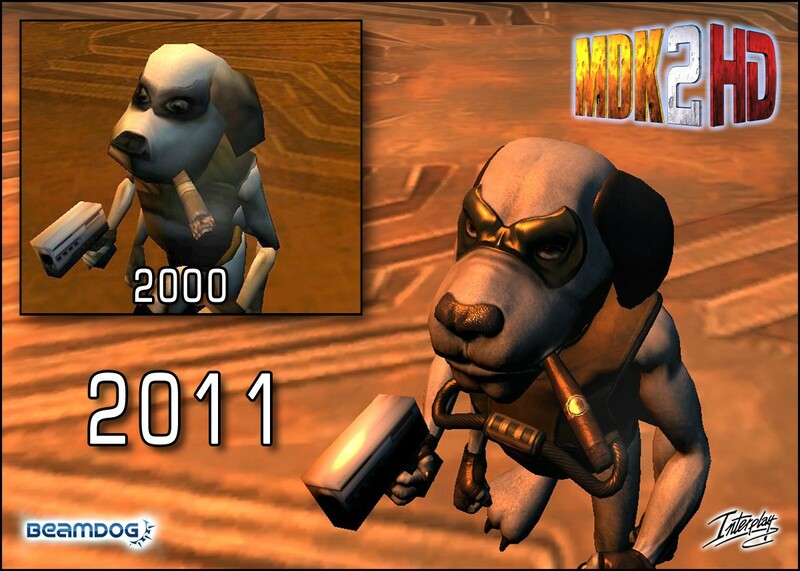 If you not played yet in MDK 2 HD, you have a great opportunity to try it. Now you can buy the game for $ 9.99 only via Beamdog. MDK 2 HD was released on October 12, 2011. MDK 2 will see daylight on October 12th. Don't forget about our gallery, which is full of new screenshots. Prepare your chainguns, boys and girls! It's time for MDK 2 HD! MDK 2 HD will be released in September this year. "Edmonton, AB, Canada. MDK2 HD. Enough said! Or… maybe not. The fine chaps at Interplay Entertainment Corp. and Overhaul Games are pleased to announce the impending launch of MDK2 HD, bringing Interplay's wacky action-adventure to a new generation of gamers. With a visual overhaul that would make a Beverly Hills plastic surgeon wail with jealousy, as well as a wide range of gameplay tweaks and reworked audio, MDK 2 HD will launch exclusively via Beamdog.com in September for just $14.99." If you want more details, click the "Read More" button below. There you'll find screenshots from MDK 2 HD in high resolution. Follow this link to see the first screen of MDK2 HD, comparing the original Max and the new HD version. According to the date specified by Interplay, MDK 2 for Wii will be released on May 9th. To read more about the trailer, click the "Read More" button below.